I made my way to the Empress and Hierophant sim, currently under construction by Immortalis and Alchemy Cyannis. The tp landing presents a stunning view over rolling hills and rock walls. I wanted to embrace it, feeling like I had been transported to Derrynane, Ireland. Immortalis was busy building, holding a sheep in his arms. The Cyannis’ are planning a bed and breakfast, and from the looks of the site so far, I’d make plans for an extended stay. The stones at Empress and Hierophant are finely crafted, warm and lichen covered. 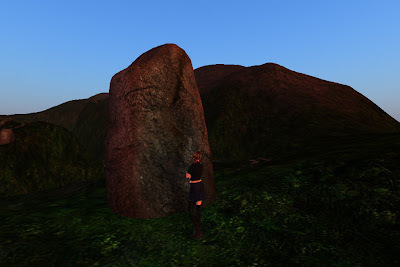 I ran up to one menhir and imagined placing my palms on its surface. Rambling up a hill I got those butterflies in the tum when standing too close to a ledge. The waves below churned bright and blue and I felt compelled to walk and walk along the worn paths winding ‘round the island. Instead I tp’d my fellow intrepid explorer Wyatt and we sat among the blinking sheep, totally absorbing the countryside. In this kind of place, your mind goes meditative, and we let our minds wander and ramble like our bodies had done, contemplating our environments, both inner and outer. Empress and Hierophant is extraordinary. Read more about it here. I can’t mention megaliths without mentioning Julian Cope. For you stone lovers, you must purchase a copy of his book The Modern Antiquarian.